“Betting Manager” is a Windows Bankroll Management Offline Application, excelllent for keeping performance of a punter’s betting picks. Based on a management system, is helpful to low any risks of high stakes. A built-in calculator produce the next stakes, according our picks and the odds given. An Excellent Tool For Any Punter. Replace Excel Sheets With A Simple & Easy App, & Stop Wasting Your Time. Half Time Or Full Time? 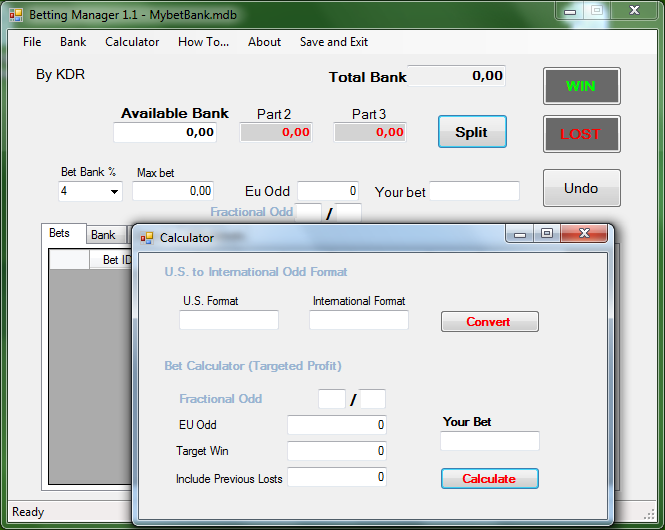 Create a bank file for each type and start keeping track of your bettings. Some testimonials below give us a starting satisfaction. -Leaving Excel Sheets behind was a very nice feeling. Now I have a simple way to control my bankroll. –I used to follow a number of tipsters. Some of them paid. Now I know who gives me real winning predictions. I keep a different bankroll for each one. Nice Idea. Now This Bankroll Management Software, Keeps Everything For You. Keep tracking your stakes, recording every winning or loss you had. Synchronize your bettings and explore the informations you need. Make your Bankroll Management Simple And Easy. We have the tools to make it quick! Use them NOW!